Rho LTW Beanie is rated 4.9 out of 5 by 11. Rated 5 out of 5 by CAMPITE11I from Cannot Get Any Better Than This I am a raging fan of Arcteryx's merino wool/spandex blend. This fabric feels so good next to your skin you will forget your wearing it. This particular beanie is so small and lightweight you can easily keep it in your jacket pocket for storage and barely even notice its there. My favorite part of this lightweight beanie is how breathable it is. It is fantastic for high output activities and I even wear it jogging. Somehow even though this fabric is breathable - it keeps me warm on cold winter days as well. Love it! Rated 5 out of 5 by Gguz88 from Perfect Beanie I'v only had a small number of beanies that fit well, while at the same time keeping my head nice and warm but not too hot. Usually the ones that worked well to keep my head warm, were often heavy fabrics that squeezed my ears real tight and made them sore. So with ears that are kind of big, beanie selection was always tough. This beanie however, is awesome, best I'v ever had. It has loose but secure fit so my ears don't get sore. It's been camping with me in maybe 40F degrees and kept my head and ears warm even at rest/while sleeping. Even after it warmed up to about 85F my head didn't overheat while doing some pretty intense sport climbing (forgot I even had it on). As much as I try to resist not being a brand conservative person, Arcteryx always seems to make a product that keeps me coming back to them, and this beanie is one of them. Rated 5 out of 5 by Matt from Excellent versatile beanie This has been my "go to" beanie/hat for my winter activities. 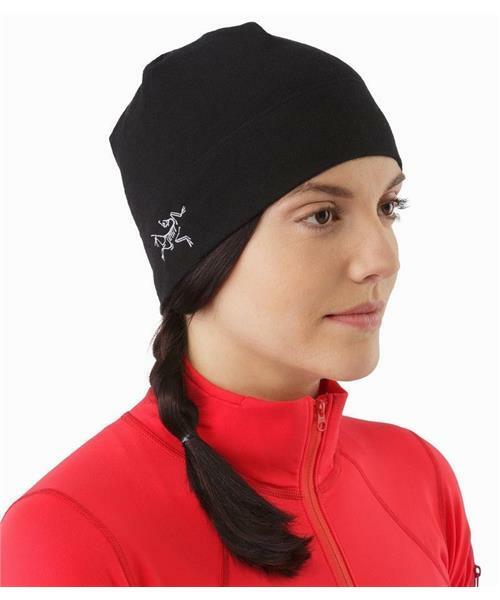 It is just enough to keep my head warm and wicks away moisture no matter what outdoor activity I am doing. It fits perfectly under my helmet and is easily stored in a jacket or pant pocket when not in use. I can't say how much I love this beanie! I've lost it twice and bought the same one to replace it because it's just part of my everyday kit! Rated 5 out of 5 by Anonymous from Super warm, low profile. When it's extremely cold outside tower work requires no exposed skin. I use this beanie in a layering system that still allows me to wear a helmet and goggles. I also use it for running and under my motorcycle helmet. It's like wearing spandex that generates its own heat! The wool is not as itchy as other brands and dries quickly on its own. Do not dry this product or any of the Rho LTW products, they shrink! Rated 5 out of 5 by Petri from Excellent light beanie for cool and cold conditions I've had this beanie for almost 2 years now and it is awesome for all kind of activities from ice climbing to hiking and running in cool and cold conditions. Rated 5 out of 5 by GerryH from Great lightweight beanie Lightweight yet warm, lies soft on your head with just the right amount of stretch. Perfect for in town or in the mountains. Breathes well when ascending, without wetting out! Rated 5 out of 5 by karstkeiler from warm and lightweight perfect product as well as all the other merino wool garments made by Arc'teryx. It is warm and comfortable also used as base layer under a motorcycle helmet.